On Black Friday the S&P 500 officially entered its second correction of the year. One of the big reasons for the sharp market drop was worries that the Federal Reserve is heck bent on hiking rates to dangerous levels that could trigger a recession and bear market. Let’s take a look at what exactly investors are so scared of, but more importantly why those fears are likely to prove overblown. Which means that today is a great time to consider adding BlackRock (BLK) and Texas Instruments (TXN) to your portfolio. These two deeply undervalued blue-chip dividend growth stocks are likely to generate 18% to 19% CAGR total returns over the coming years, making them excellent opportunistic additions to any income growth portfolio during this correction. The big fear that investors have is that the Fed, afraid of the hottest job market in 20 years (with the lowest unemployment in half a century), will feel the need to hike rates five or even six times. 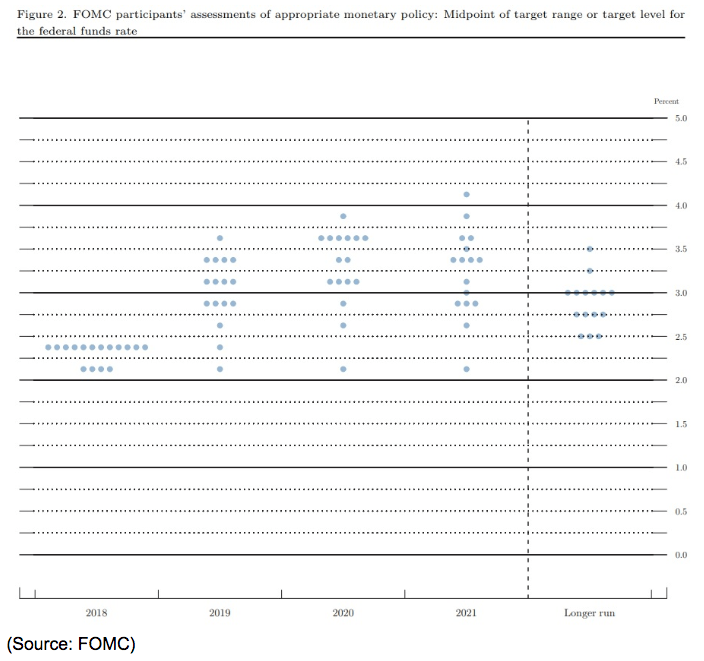 That’s based on the Fed’s latest dot plot, which shows the estimates of where the Federal Fund Rate will end up in the future.